DULLES, Va.Feb. 20, 2017-- Orbital ATK (NYSE: OA), a global leader in aerospace and defense technologies, announced today that the company has booked approximately $600 million in orders during the past three months for the company s medium-caliber cannons and related munitions. 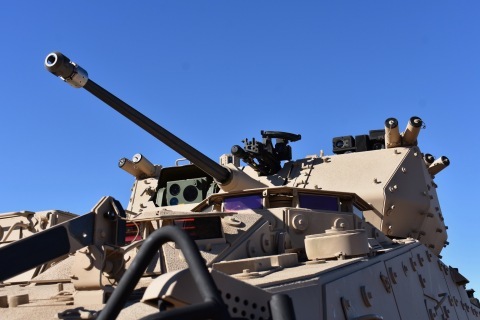 These orders were placed by multiple customers who have contracted for the popular MK44 and M230 link-fed Bushmaster Chain Guns , the associated medium-caliber tactical and target practice ammunition, and aftermarket services. The delivery schedules for the new orders extend through 2020. With an installed base surpassing 16,000 cannons worldwide, Bushmaster chain guns are sought after for their battle-proven reliability and combat effectiveness by the U.S. military, as well as allies around the world who are fielding new systems or are upgrading existing platforms to meet growing threats. Their capabilities are now being further enhanced by the company s introduction of advanced medium-caliber ammunition. Our cannons are easily integrated onto a variety of land, air and sea combat applications, said Dan Olson, Vice President and General Manager for the Armament Systems Division of Orbital ATK s Defense Systems Group. Our delivery of these products reflects our core mission to work together with our integrator partners as well as our allies to create and deliver superior armaments and services for those who defend their nation s security. During the past five years, Orbital ATK has focused its business strategy to better serve our domestic customer base and to grow internationally by providing the highest product quality and affordability, while also being scalable to meet tomorrow's requirements, said Mike Kahn, President of Orbital ATK Defense Systems Group. We are now investing in the development of advanced ammunition featuring precision guidance to provide unmatched capabilities using our existing cannons, with initial products entering production later this year. The MK44 cannon has the ability to use Orbital ATK s 30mm MK310 Programmable Air Bursting Munitions (PABM), in addition to its complete family of 30mm x 173mm ammunition, for precise point-in-space burst to defeat enemy targets. The 30mm PABM offers air burst, point detonate, and delay fuze settings, to provide lethal suppressive fire through its air-burst function or to penetrate light armor vehicles or reinforced concrete walls. The MK44 is also upgradeable to a 40mm configuration that offers greater stand-off range and increased firepower for the already highly effective gun system. Currently, Orbital ATK is developing a full family of 40mm ammunition to include a 40mm PABM which was recently demonstrated during the company s Bushmaster User Conference in early February. Orbital ATK s M230LF is a link-fed version of the Apache attack helicopter s gun. The M230LF fires 30mm x 113mm ammunition that includes High Explosive Dual Purpose (HEDP) and ballistically-matched training rounds. The HEDP round provides armor defeat capability with a 2,000 meter range, with other target defeat out to 4,000 meters. Weighing about 75 Kg, the M230LF is easily integrated into a variety of light tactical vehicles and weapons stations for both remote and manned operation.